Gregory Michie is a public school teacher in Chicago and Senior Research Associate at the Center for Policy Studies and Social Justice at Concordia University Chicago. His latest book, We Don’t Need Another Hero: Struggle, Hope, and Possibility in the Age of High-Stakes Schooling, was published in November, 2012, by Teachers College Press. 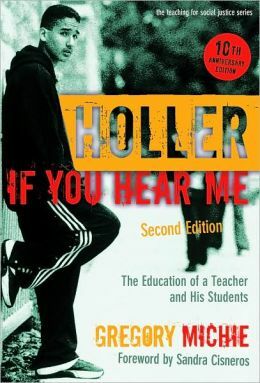 He is also the author of Holler If You Hear Me: The Education of a Teacher and his Students (2nd edition, Teachers College Press, 2009), and See You When We Get There: Teaching for Change in Urban Schools (Teachers College Press, 2005). My introduction to his work came via Twitter, where I found him posting pictures of the Three-Day March launched by the Chicago Teachers Union in opposition to Mayor Emanuel’s proposal to close schools in Chicago’s low-income communities. 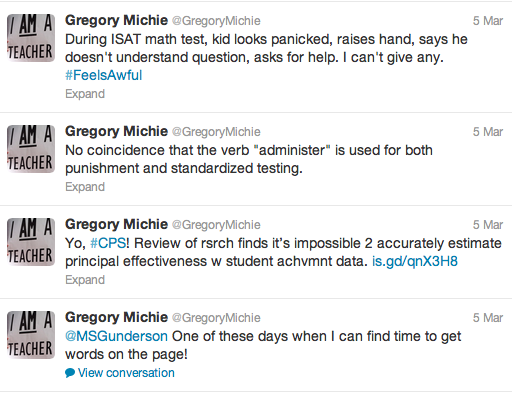 As I learned more about Gregory Michie, I was drawn in by his honest and critical writing about the classroom, his path from teacher, to teacher-educator, to writer, and finally to his unusual decision to return to the classroom as a middle school teacher in Chicago Public Schools after ten years of working in the academy. Here you will find our conversation about the issues we face in the classroom, as well as the effort to fight against school closures on Chicago’s South Side. I discovered your work through Twitter. Since I’ve become more involved with social media, partly from doing this publication, I want to start off by asking you how you use social media in your professional life, as a teacher, as an activist, as a scholar. How do you engage with social media in those roles? That’s a good question. I really didn’t engage much with social media at all until the fall of last year. I think I signed up for a Facebook account about five or six years ago because my brother kept bugging me to do it, and I never used it. And Twitter, honestly I hadn’t paid that much attention to it. I do utilize technology a lot in my personal life and in my classes, but when I read about Twitter it didn’t appeal to me that much. But last summer, I decided to return to CPS (Chicago Public Schools) to teach kids–I’d been a professor of education for the past decade–and a week after the start of school, we went on strike. I really signed up for a Twitter account because I started to realize it was the best way to get fast, accurate information about what was going on with the strike. It was very important for me to know what was going on, and because I just came back I didn’t have a whole lot of connections with people who were intimately involved with the strike. So I just started following people and I wasn’t Tweeting anything much for quite awhile. But after the strike one thing I thought about was, you know, I’ve written quite a bit, but I’m a very slow, methodical writer, and I knew going back to teaching in a K-12 classroom that I wasn’t going to have a whole lot of time to write, being kind of a first-year teacher again. 140 characters at a time seemed like something I could probably crank out, so I decided to use Twitter to chronicle my year. Mostly I just Tweet about what’s going on in my classroom, things students say that echo in my head, and school policy and what’s going on in Chicago Public Schools as a whole. I think I’ve gotten way more out of it than I’ve contributed. I’ve connected with a lot of Chicago public school teachers, people who are really involved in policy and activism who I probably wouldn’t have known. So that’s been really good. I see a connection in your work, and your writing, and what you’re saying now. It seems like you really value teacher and student voices, and I wonder if you think of using social media as a way of sharing voices from the classroom. Listening to students and trying to get a better understanding of their concerns and their interests through their own voices has always been crucial to me. The classroom was the perfect place to do that. I tried to create ways in the classroom to center on student voices and to have students feel legitimately heard, no matter what their opinions are. As for teacher voices, there are so many more teacher voices out there than there were back when I started teaching. When I published my first book, in 1999, the only way I remember hearing teacher voices was an occasional book or publications, like Education Week, which would occasionally have a teacher voice in there, but not often. Or maybe a rare op-ed in the newspaper. It was really hard to get your voice out to a wider audience, and to teachers in other parts of the country and other parts of the world. Now we have the ability to communicate, to organize, to not feel alone in our struggles. I think all of those things have been really great. 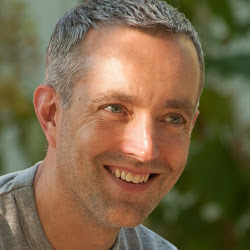 I’ve benefitted from connecting with teachers from across the U.S…. New York City, Seattle, Washington DC. Teachers that either have blogs or are Twitter users. I’ve learned a lot from them – not only what they’re doing in the classroom but how they’re putting their classroom work in the context of larger issues of policy and what we can do to improve schools and make them work better for the kids who need them the most. Unfortunately, despite the fact that we have a lot of teacher voices out there, a lot of the decision makers, policy makers, and people in power, don’t listen very much. There’s an echo chamber and they listen to each other a lot more than they listen to classroom practitioners or students. That’s part of the reason why we’re in the mess we’re in right now. It’s hard to get a voice at the table, but it’s encouraging that so many are out there trying. That’s the first step: getting your voice out there. There isn’t a guarantee that you’ll be heard, but there is a guarantee you won’t be heard if you don’t speak up. Social media has allowed more teachers to take that first step, to be heard. Some have been extremely influential and really do have the ear of a lot of educators, and hopefully some people in decision-making positions too. I really appreciate what you’re saying because that’s really the goal with this publication. We try to make visible conversations between educators and really share those voices that I don’t hear too much of. So, I agree with what you’re saying and really feel it to be true, and that leads me to ask you about something you wrote about in your book, Holler If You Hear Me. I love that book because it really feels to me that it is the voice of a teacher and I could relate to so much of what you were saying. I wanted to ask you about one point that you made in the book, which is this idea of letting the students in the classroom have some control, have some voice, and have some power over their own learning. As a teacher that’s something that I always strive for, but I wonder if you could talk a little bit about the feeling of letting that happen in the classroom. I’ve always struggled with the difference between the classroom that I envision–the classroom I believe in, the classroom I think students would most benefit from–and the classroom that actually plays out. It’s easier to talk about what a meaningful educational experience should look like than it is to enact it. I taught for ten years the first time around and I was a teacher educator for ten years after that. That can’t help but put me in a better place to begin than just going into a teaching position never having read or formally studied education. I was better prepared to create the kind of classroom that I’d like to see, but it’s still difficult and there are some additional pressures now that make it harder, especially for those teachers who may not be coming in with a lot of confidence in their own beliefs. You know, a lot of teachers come in with their own philosophy – that corny assignment that’s part of most undergraduate education programs. You know, “What’s your philosophy of education?” I think students either don’t take it seriously, or see it as another hurdle for graduation and something that’s not that important. There’s a separation that often occurs in teacher preparation where the philosophy piece is from the practice and what you actually do. It’s a real shame because every minute of every day, your philosophy is tested and you either hold true to it, try to hold true to it, or abandon it bit by bit. I think the more sure you are of what you believe–knowing that those things are going to evolve and change, but still having a grounding in things that you believe–is crucial for young teachers going in. The second time around I do think I was going in with more confidence, more of a toolkit of strategies of things I’d done before, things I’d seen other teachers do, which is a big benefit of having spent 10 years as a teacher educator. I was in hundreds of classrooms and I’ve seen many teachers who would run circles around the work that I did as a teacher. That was a great learning experience. But because of the pressure of the narrow accountability of testing, and that being what a lot of school leaders and district leaders are looking for, I think teachers can feel really pressured to keep one eye on that. Even if you don’t believe that testing is an accurate measure, even if you know that the kids you’re teaching have so many other things that they’re up against that aren’t accounted for in test scores, even if you think that the direction schools are going is really wrong-headed, there is still this undercurrent pulling you toward compliance and it’s hard to resist it at every turn. I’ve resisted in a lot of ways, but I also felt some pressure coming back to teaching after being a teacher educator for ten years. I wanted to be a team player. I didn’t want to go in with the attitude of, “I don’t care about any of this stuff. If I get fired I’ll go back to being a professor, and I’ll just ignore the mandates while other people are feeling the pressure in some way to follow them…” So, that’s always been on my mind. I really want to take into account the pressures other teachers are feeling: which ones are legitimate, which ones we need to take account of, and which ones can we toss aside and say, “This is ridiculous, let’s ignore it,” or say we did it and not do it. Creating a classroom that goes against the grain of test-driven teaching and learning is a challenge and not just for brand-new teachers. It’s been a challenge for me this year. And now that we have a week left in our school year, I’m not looking back at the year as an unqualified success where I did all these amazing things with my students. Good things happened. I had some great days, and we did some pretty solid units and projects, but sometimes I felt like I was too structured just because I remember what happened the first time. I remember being pretty unstructured in my approach and that backfiring on me. There’s maybe not such a fine line between student-centered learning and a chaotic classroom. You can go from one to the other pretty quickly, and that was a lesson I hadn’t forgotten. So, figuring out how to have choice, how to have voice for students in the classroom, how to hold onto a curriculum that is grounded in student interests, and take into account who they are and where they’re coming from–I don’t know that it’s any less of a challenge than it was 20 years ago. Maybe even more so because of the narrow conception of that the purpose of schools is to raise test scores. That didn’t exist when I first started teaching. You’re talking a lot about being that teacher that the kids need you to be. What kind of teacher is that? I still really believe in project-based learning and that students like having something to show for their time in school, instead of just a test score. We have a first-year art teacher at our school this year and she helped the kids do these really big word sculptures, kind of like installation art. Groups of kids selected nouns and adjectives and made these 6-foot-long word sculptures out of paper mache and painted them. They’re all around the school now and they’re beautiful. Where is that going to show up on the MAP (Measures of Academic Progress) tests? It’s not! But when I look around and see those words and all the work that went into them, that’s the kind of teaching that I would like to see more of, especially in schools where students are struggling and often disengaged from traditional education. They’re excited about it, they’re engaged in it, and they’re proud of what they did. That’s how kids should feel in school. They shouldn’t feel beat down and bored. I’m not suggesting that art is all kids need, but no matter what the subject is, the need to be engaged, invested in what they’re learning. I think there are so many teachers out there who are trying to do those things, but they’re doing them in spite of current policies, not because of them. They’re swimming upstream pretty much every stroke. And I’m interested in that struggle because when you talk about how these things can be difficult to do, and you have to go against policy or testing, and work inside your own philosophy of teaching, one thing that I find is that I’m also struggling because the students have developed ideas of what their own learning is, and that is influenced by the testing. So, for example, if I teach in a way that is student-centered and project-based, and another teacher in my building is teaching for the test, the students might end up valuing the student-centered learning less than they do the test-prep because they see the test as evidence… they’ve bought into that idea that the test score is really the most important thing. Have you noticed that in your experiences with students? Absolutely. I think that’s always been a struggle, even before this most recent push for accountability. I remember when I first started teaching in Chicago we didn’t have the pressure around standardized tests, but we did have a lot of what Martin Haberman called the “Pedagogy of Poverty,“ and it’s basically just keeping kids quiet, feeding them worksheets, “doing work,” as the kids would say. And sometimes when I’d come in with something more abstract, a kid would just come in and say, “When are we going to do some work?” So, yeah, we all get socialized by our environments, and when we have school environments that value test scores above all else, we can’t be surprised when kids start to verbalize that and accept that as what education is. I don’t think there’s a simple answer to it but one thing I tried to do this year, and some of my colleagues did as well, was engage the kids explicitly in discussions about education, make that a part of the curriculum and talk about testing. Like, when the whole protest was going on about the MAP test in Seattle, I had the students read a few articles about the protest, and write and talk about what they thought about it. One day a bunch of students wore red in support, and we sent pictures to the Seattle teachers to show that students in Chicago were supporting what they did. Most students, once they are pushed to think about what a good education is, they realize that it’s way more than just being the passive recipient of information and taking a test on how much of it you remember. But, if we don’t engage students in those kinds of conversations, the socialization process just becomes the default mode of thinking about it. I think that might have been one of the other pressures I felt this year. I wanted my media literacy class to feel legitimate in the kids’ eyes. They’d even say, “Are we getting a grade on this? Are you going to be a real teacher next year?” And part of me doesn’t want that to phase me, but there’s another part that sees how over-testing has affected the way kids see education. It’s hard to blame them, but I really want them to see the value in learning. When you’re doing things that aren’t so rote, that aren’t so cut-and-dried, it also requires more of students. Students can also object because they have to think more, and they may not be used to it. It’s harder to think more critically than just answer the questions at the end of the chapter that are pretty much all just recalling information. That’s another barrier that can come in. Kids can also be conditioned to not have a whole lot expected of them. I just really relate to everything you’re saying. I think you really know what that experience is like. And I read a lot about different strategies and things that I think are really great ideas, but you don’t often hear from somebody who really knows what it’s like to teach that in the classroom. I teach English in high school on Long Island, and I also taught in New York City, and I’ve also had the experience of teaching an interdisciplinary course that had no set curriculum, no test. It was similar to your media literacy course, so I can relate to a lot of that. And I know that you struggle with students, but I’ve also found that it becomes more difficult to do that work when you’re putting it side-by-side with other styles of teaching. Sometimes the work that I’ve done, which is similar to what you’re describing, is not always received well by teachers. Yes, that can happen. This year, I have been fortunate to work with lots of like-minded colleagues. The two science teachers I work with do tons of hands-on, discovery based learning, and the reading teachers are very good about choosing themes or topics or novels that relate to students’ experiences. So, I feel very fortunate that the people I work with have a common philosophy and common belief in what a good education is, and how we can best serve the students who come to us each day. That’s a huge benefit because sometimes you don’t have that, and that can cause some students to question what’s going on, which actually is probably a good thing. They should be questioning. That’s another paradox of critical pedagogy. Sometimes it seems we want the students to question everything except us. It’s okay when they’re questioning the government, or the social structure, but when they turn it back on us and say, “Why are we doing this anyway?” We revert to, “Because I said so!” That worst, base instinct. Exactly. So I try to remember, even when students are questioning and resisting, that that’s a sign of life, you know? At least they’re not just passively accepting everything. And since we’re talking about questioning and resisting, I wanted to ask you also about everything that’s happening now in Chicago with the closure of schools. What is it like to be teaching, and working, and living, in Chicago right now with all of this going on? On one hand it’s disheartening, discouraging, enraging… you see some of the things that happen and you are shocked and outraged at the audacity of a mayor and a school board to just ignore the voices of the community and push through their agenda. They had quite a few community meetings to provide space for community voices, but when it came right down to it the board voted unanimously to close the schools, except for a handful. They did exactly what they had planned. So, they use phrases like “engaging stakeholders,” but it’s mostly just a show. That’s the part that’s so discouraging. For some people, they get to the point where they say, “It doesn’t matter if we protest, doesn’t matter if we speak up. They’re going to do what they’re going to do,” and that obviously is a place we don’t want to be. But Chicago is a place where there’s a whole lot of energy for change, and many different groups of people are speaking up, speaking out, researching the issues, connecting with each other, proposing alternatives. I’ve been in Chicago since 1989, and the schools have always been contested territory, but I don’t ever remember this much positive energy around pushing for a different direction. It’s been over a decade now of the accountability craze and the focus on testing, less decision making in the hands of teachers and more top-down decision making. But this year, with the strike and the school closures, it’s really galvanized public school teachers. It was amazing to see how united teachers were during the strike. Yeah, the teachers want to make sure we get the raise we deserve and that our benefits aren’t severely cut, but I never got the sense that that was what was animating people. I thought it was the 10-15 years of these repressive policies where teachers felt their voices weren’t heard. They were basically being forced to do things that they didn’t believe in, that they didn’t think were good for their students. And that’s not just in schools with poor kids, but almost everywhere that I go–Chicago Public Schools and the surrounding suburbs–teachers just feel like enough is enough. We have to stand up, we have to speak back, and we have to have a different vision. So that’s the really hopeful part. We’re speaking out against an agenda that is an anti-public school agenda. I think a lot of the so-called school reformers would be happy to move more toward vouchers, more toward charters, more toward privatization, more toward being able to make money off of schools, and if poor kids can get an education in the meantime, that’s fine, but that’s not what is driving it. Despite the rhetoric, that’s not what’s driving it. But there are a lot of smart people in leadership right now of the Chicago Teachers Union. We’ve got a number of grassroots, parent and community groups, like Parents United for Responsible Education, More Than A Score Chicago, Raise Your Hand Illinois, Chicago Students Organizing to Save Our Schools, Teachers For Social Justice. This whole year these groups have been the ones coming up with rebuttals when CPS says, “Okay, we’re going to save such and such million dollars if we close this many schools…” A week later you have one of these groups coming out saying, “We crunched the numbers, and you’re way off.” Or CPS saying the closures are going to impact 30,000 kids, when it turns out they’re going to impact 46,000 kids. Or CPS saying there was going to be a budget crisis, when they’ve been saying there’s going to be a budget crisis 6 out of the last 8 years, and most times there’s a budget surplus. It’s a disingenuous rhetoric and they have some very skillful deliverers for the rhetoric. They can be very convincing if you’re just hearing them say, “We want to provide a better education for these kids who have been in under-resourced schools.” Who’s going to be against that? What they don’t say is, if these schools are under-resourced, who under-resourced them? The parents in the neighborhood? No, it’s been decades of being ignored by CPS and by the city. And it’s not just the schools, but many of the neighborhoods too. Many of the neighborhoods have been neglected by city services and programs. Go into neighborhoods where schools are being closed, you see streets with so many foreclosures. These are neighborhoods that have been devastated in so many ways. To take away a school, which in many cases is a beacon for a community… and I’m not saying that all of these schools have done amazing jobs. They need help, many of them. But that’s a whole different way to look at it: these schools need help. How can we help them? Instead of closing them down and making the kids walk a mile to another school that’s basically not doing any better, even by the school district’s own metrics of what a successful school is… it’s stupid. But you have to move beyond that because you know these are smart people making these decisions and they are using kids–in most cases, African American and poor kids–as pawns for their own agenda. And what does it feel like in your school right now, in this environment? Are kids talking about it all the time? Since our school is not on the closure list and never was, you’re a little bit removed from it but students are definitely paying attention. And there are definitely teachers who are very involved. Several teachers at our school went to community forums, even though our school was not one of the ones that was supposed to be closed. A bunch of us went to the marches and protests. That was one of the things that most impressed me. When I went to the marches I overheard so many people say, “Well, my school’s not on the list, I just really wanted to come here and support the others.” I think teachers, and parents, they can feel… you can imagine… what would that feel like? Your school’s going to be closed, you’ll be going to a whole different community. According to one estimate, 27% of all African American children in Chicago would be impacted by the school closings. That’s just unfathomable. So after I read that, I Tweeted out, “Can you imagine 27% of all White children in the city having to deal with their schools being closed and their lives disrupted?” You can’t imagine it! It wouldn’t happen. They’d figure it out, they’d get private money involved. There would be a rescue if we were talking about White kids, and that’s the part of this that is so wrong. Many people who have opposed the closings have tried to get the point out there that the closings are racist, whether or not that’s intentional on the part of those in power. The end result is racist, and that is what matters. I think there’s a sense of mourning, and a creeping worry that if they can close 50 schools this year, who’s next? So, it’s been a very difficult year in many ways, and I think one of the side effects is that it has rightly required a ton of energy on the part of community groups, parent groups, union leadership, classroom teachers. And there are other things we’ve got going on that haven’t gotten the attention they needed because of this, like the value-added teacher evaluation plan, the insane amount of over-testing, the Common Core adoption (which is rolling out unquestioned), and the impact of violence. We had 506 murders in Chicago last year, most of which were gun related, and many of the victims were young people. We’ve had to take our eyes off of some of those things just to try to keep schools open for kids who need them. That’s wrong. I’m glad there was so much energy that went toward that, but I think it just goes to show how many fronts there are that teachers have to be concerned about and thinking about, in addition to how hard it is just to be a good teacher in your classroom every day. It’s very, very hard, and it asks a lot of classroom teachers to be able to be good teachers and be activists. Well, I really appreciate that you are out there sharing your voice in so many different ways–writing books, blogging on the Huffington Post, and being active on Twitter. The work you are doing is incredible. As a teacher and as a student I really value what you’re doing and I appreciate your taking the time to talk to me on a Saturday when I know you probably have papers to grade and work to do, and you need to relax and enjoy your weekend as well. Thank you very much for speaking with me! I enjoyed the conversation a lot and I think it’s great what you’re doing. Providing a forum for people to hear other voices and get conversations started or to continue. I know it’s a ton of work, so I think it’s awesome that you’ve taken on this project. Well, we enjoy it and learn a great deal from these conversations. Thank you! 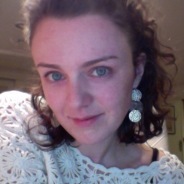 Deirdre Faughey (Founding Editor, Publisher) is a doctoral candidate in the Curriculum and Teaching Department at Teachers College, Columbia University. She completed a Masters degree in the Teaching of English from Teachers College, and a Bachelors degree in Literature and Creative Writing from Bard College. She currently works as a high school English teacher, and is the Managing Editor of International Ed News.